The History of Saffron | From Queen Cleopatra to Alexander the Great! The History of Saffron - From Queen Cleopatra to Alexander the Great! Like most herbs and spices, the history of saffron spans thousands of years! Originally native to Asia, its use became widespread along the spice routes into Europe, India and China. And people have been cultivating and using the delicate threads in various ways for over 4,000 years. Alexander the Great is said to have adopted the use of it on his campaigns through Persia using it in his baths to heal battle wounds, a practice he brought back to Greece. It has also been documented that probably the most famous Egyptian queen of all, Cleopatra, used saffron-infused baths to increase sexual pleasure! In North East Sri Lanka, the Tamil people have used it in various ways for more than 2,000 years as a cure for headaches and to aid in labour and delivery. Buddhist monks in India began wearing saffron-coloured robes more than 2,000 years ago, although today their robes are dyed using the much cheaper turmeric spice as a substitute. And there are frequent mentions of it in ancient Chinese medical texts. 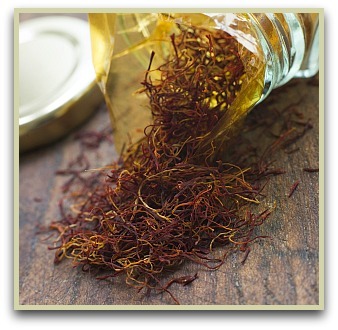 The History of Saffron Today! Saffron spice is still widely used around the world as a fabric dye, particularly in China and India. It also has many health and well-being uses and is used in modern medicine for its anti-cancer properties and antioxidant properties. Click to read more about saffron benefits. Today, the pretty saffron plant is cultivated in many countries, ranging in a broad band stretching from Spain, Italy and Greece to India. But it's Iran which takes the biggest producer crown, producing more than 90 per cent of the world’s supply. I don't think I can write about the history of saffron without mentioning that, throughout its thousands of years of usage, and still to this very day, this rare spice has been harvested by hand! With only three thin, delicate strands available in each small flower, it takes up to 75,000 flowers growing in an area the size of a football field to produce a single pound! 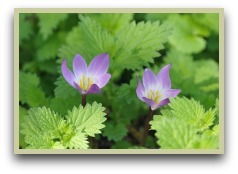 So it is easy to see why the saffron crocus is valued above all other herbs and spices. More on the bulbs and plant.